Since so many people have asked about insulating blinds, window treatments, window quilts and the rest, I wanted to point you to an article that covers it all instead of me trying to do the same. 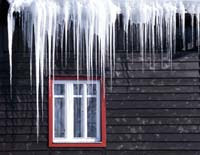 Please visit this recent article in Mother Earth Living, Save Energy with Winter Window Treatments. It covers window basics, commercial window dressings, homemade quilts and other do-it-yerself options such as bubble wrap, acrylic storm windows and other such stuffs. Now, get started and make your windows all cozy for the winter. I had never thought of using bubble wrap until your postings! thanks crunchy for posting the link for window treatments! wow, now i know what to do with all the bubble wrap i've saved to take to the shipping store "soon." We started using the bubble-wrap concept last winter-- it's fabulous and fun. Almost like magic how it sticks to a mist of water, then just comes off in the spring!